and succeeds in liquidating a successful company, extorting properties and eventually committing suicide. That is Act I in two decades of victimisation. 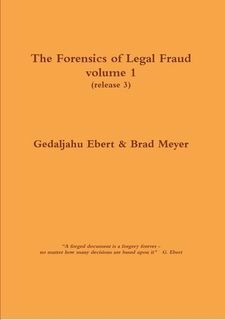 It will feature in Volume 2 of The Forensics of Legal Fraud. Volume 1 describes a most outrageous case of fraudulent banktruptcy that is representative of many such cases, including Paulette’s Act III. Act II is about the extortion of properties. Act III is about a fraudulent bankruptcy based on a non-existent debt. Act IV is about two insurance claims. The book will be the outcome of this collaboration between Paulette H Cooper and Sabine K McNeill, a ‘web voice’ for victims of white collar crimes.